Removing Bias from the Workplace: Is Your Company Fit for Blind Audition Hiring? Whether posting a new job or back filling a position, recruiters often search through a seemingly endless supply of resumes and cover letters. Hiring managers read candidates’ writing samples and check social profiles. All of this leads to that decisive step in the hiring process – holding the interview. But what if the interview was replaced with an assignment to assess the candidates’ skills? Would this give hiring managers the chance to actually determine if the candidate is capable of doing the job they are being considered for before hiring them? Enter blind hiring – the new buzz in talent acquisition. Blind hiring anonymizes the candidate selection process by evaluating candidates exclusively based on their abilities to perform certain tasks, which will help the hiring manager gauge whether or not they will succeed in their job. Gone are the days when an elite college degree or experience in Silicon Valley will automatically secure a job. Blind hiring places the emphasis back on the skills needed for the job. According to iCIMS Class of 2016 report, 74 percent of recruiters cited written and communication skills as most important when hiring entry-level employees. In blind hiring, hiring managers will provide candidates with a task or project, so they can show how well they can perform in the position, rather than just talk about their previous experience and expertise. Candidates are asked to complete assignments like creating a web page or developing a social media strategy. Personal information such as a candidate’s name and even resume are not considered. The idea is that best person for the job may not be who you would typically hire. Perhaps he didn’t go to college and instead taught himself how to code or maybe she has a gap in her resume from taking time off to raise children, yet she’s adept in graphic design. Candidates like these may not have shown up on a hiring manager’s radar, but blind hiring allows them to demonstrate why they should be hired. Conversations around hiring for cultural fit are all the rage right now. But hiring managers may be guilty of selecting people who are too similar to them, which will result in too much conformity, leading to group think and potential failure. Just because someone can talk about the Giants game with you on Monday morning doesn’t mean they are the best person for the job. Blind hiring automatically removes any bias hiring managers may have, consciously or subconsciously, in looking for a candidate with a particular background as well as hiring based on gender, race, or age. Along with complying with EEO requirements, removing any possibility of bias from the hiring process is good business practice. In a study of 366 global public companies, consulting firm McKinsey found that ethnically diverse companies are 35 percent more likely to outperform their non-diverse competitors. Of course you want to establish rapport with the candidate you’re interviewing, but on the flip side, hiring someone who looks and thinks like you can cause companies to lack diversity and lack the ability to come up with original ideas and concepts. A study from The American Sociological Review showed that hiring managers often “go with their gut,” valuing shared hobbies above actual skills needed for the job. Even more surprising is the time it takes hiring managers to make a decision on the candidate. Sixty percent of interviewers said they made their decision within the first 15 minutes of the interview. Of that group nearly 26 percent made their decision in the first five minutes. How can hiring managers get an idea on employee’s skill level in such a short amount of time? The fact is that hiring manages don’t have time to waste on interviewing multiple candidates when they can easily and fairly hire the best candidate through blind hiring. 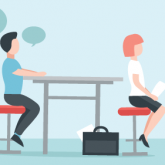 iCIMS data shows that 34 percent of recruiters conduct one to ten interviews per entry-level position with an astonishing 25 percent who said they conduct 50 interviews or more. Blind hiring weeds out unqualified applicants immediately, cuts down on time spent conducting interviews, and helps companies increase their diversity and the quality of their new hires. Women, minorities, and individuals with disabilities all have an equal shot at getting the job. Ultimately, hiring managers want someone who treats their colleagues with respect and contributes to the company’s success. Blind hiring may just be the way to achieve that success.